Aleksey Nikolskiy in Vedomosti reports that Bulava testing will resume this summer. He says the problem in December may have been a defect in the third stage engine, not a design flaw. Tests may resume this summer from the modified Dmitriy Donskoy SSBN. Yesterday ITAR-TASS reported a minimum of two tests would be conducted from Donskoy. If successful, testing would move to the missile’s intended platform, the new Proyekt 955 Yuriy Dolgorukiy, this fall. 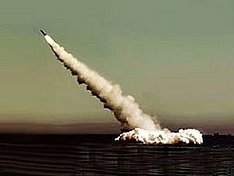 A Navy Main Staff representative told Vedomosti that Dolgorukiy would need to fire several missiles in a salvo launch. An industry source said, if all these tests were successful, a “preliminary document on completion of the first phase of testing” could be signed and serial production of the missile could start. The Defense Ministry and OPK commission investigating the December failure has provided optimism for those involved, according to a source close to the commission. In his words, a third-stage thrust control mechanism produced by the Perm-based NPO Iskra failed in the December test. So some conclude the missile’s overall design is sound and it makes sense to continue work on it. Mikhail Barabanov says “shock work” on Bulava might be risky, since MIT already promised that it could produce the missile quickly and cheaply. Konstantin Makiyenko reiterates the lack of an alternative missile to keep a naval component in Russia’s strategic nuclear forces. Denis Telmanov in Gzt.ru adds that a Defense Ministry source has not excluded the possibility that another design bureau, possibly Kolomna Machinebuilding, has gotten orders to work on a missile. The Makeyev GRTs is another possibility, but its deputy general designer responded that quick development of a missile was physically impossible. He said, even from an existing system, it would take 5-6 years. And he said no one in the country’s leadership has taken a decision to start work on a new missile. All stories repeated the expressions of support for Bulava from the Defense Minister and Navy CINC.